All our Cottages are clean, comfortable and come equipped with all the following comforts of home. There is also a fish cleaning hut with a sink and running water. The Main Lodge has a small Ice Cream Shop & Convenience Store in case you need an emergency ice cream fix or any basic essential that you might have forgotten. 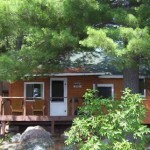 Sunfish Cottage is a 2 bedroom cottage, there is 2 single beds in each bedroom. The kitchen and living area is one lage room with a full size electric fridge, gas stove, dining table and 1 daybed. The Washroom has a clawfoot bathtub with a shower, sink, mirror and a flush toilet. 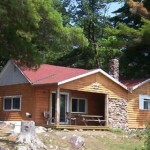 All the cottages have private BBQ’s, hot and cold running water and 24 hour electricity. 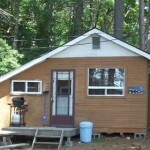 Minnow Cottage is a 1 bedroom cottage, there is 1 double bed along with 2 single beds in the bedroom. The kitchen & living area is one room with a full size electric fridge, a gas stove, table and a love seat. The washroom has a stand up shower, sink, mirror and a toilet. 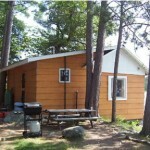 Bass Cottage is a 2 Bedroom cottage, there are two single beds and 2 bunks, 1 in each room. The kitchen & living area is one room with a full size electric fridge, gas stove, round table and a love seat.The Washroom has a stand up shower, sink, mirror and a flush toilet. 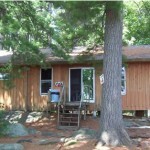 Muskie Cottage is a 2 bedroom cottage, there is 5 single beds in one bedroom and 2 single beds in the other. The living area has a double pullout couch, a daybed and 2 large couches. The kitchen is quite large with a table to seat 12, a gas stove and a full size electric fridge. 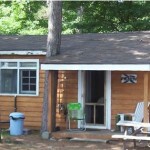 Perch Cottage is a 2 bedroom cottage with 2 single beds in one room, and one single and a bunk in the other. The Kitchen and living area is one room with a table and a daybed in it. The washroom has a standup shower and a flush toilet.